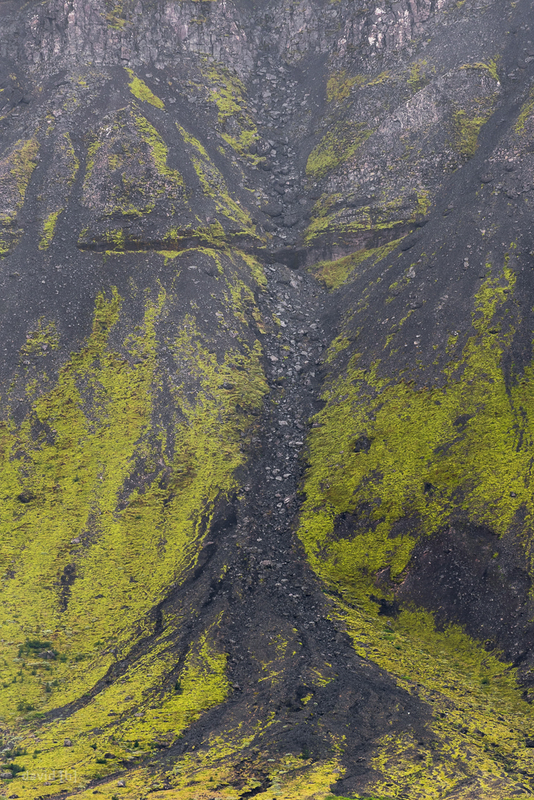 Iceland – the land of fire and ice – and the place where my three-month long photo trip will find its conclusion. It felt right, coming back to where my fascination with nature photography started back in spring of 2014. This time around, however, I feel like I know what I am doing and my friend Sandro and I had come up with quite the schedule, making the most of our 14 days here. Picking up the car and stocking up on groceries on a rainy day in Reykjavik got us started towards Vik, where we would be camping for three nights. Despite the rainy weather and the cool temperatures, there were quite a lot of tourists around and a fair number of tents set up already – though it wasn’t overcrowded. If you know the south of Iceland, you’ll notice that some of those shots are only possible from the air – leading to one of my areas of focus on this trip: drone photography. Since getting a camera drone, I’ve waited for the perfect opportunity to put it to work – and this is it right here. It opens a whole new world of perspectives and possibilities to me as a photographer. I can reach previously unreachable spots – like the top of a remote glacier – or get a different view on an otherwise overlooked area. Apart from allowing me to get some amazing images, it is, quite frankly, a ton of fun to fly the little drone as well. For anyone out there owning a drone, just having gotten one or thinking about shelling out some cash for one – keep this in mind: there are rules. Those rules are here for a reason: protecting people, animals and landscapes from reckless flying, crashes and serious injuries. We have seen too many drones flown over top of crowds of tourists, encountered too many people flying their drone right next to a big old “NO DRONES” sign. Please, please obey the rules, know your equipment, realise when it is safe to fly and when not, and most of all, be respectful and aware of everything around you and your drone before and as you fly. If people continue to ignore safety rules and regulations as they are now, it won’t be long until this marvellous tool will be banned completely. The south of Iceland saw us getting exhausted by so many beautiful spots, staying up two nights to witness the northern lights and driving quite a bit. For now we’re off to the north, where we’ll be taking it a little easier, probably visiting some hot pots and go for some whale watching! On the home stretch of our road trip, we decided to throw in one more park in Colorado, so we ended up paying the Black Canyon of the Gunnison a visit, before ending our adventure at Great Sand Dunes National Park. 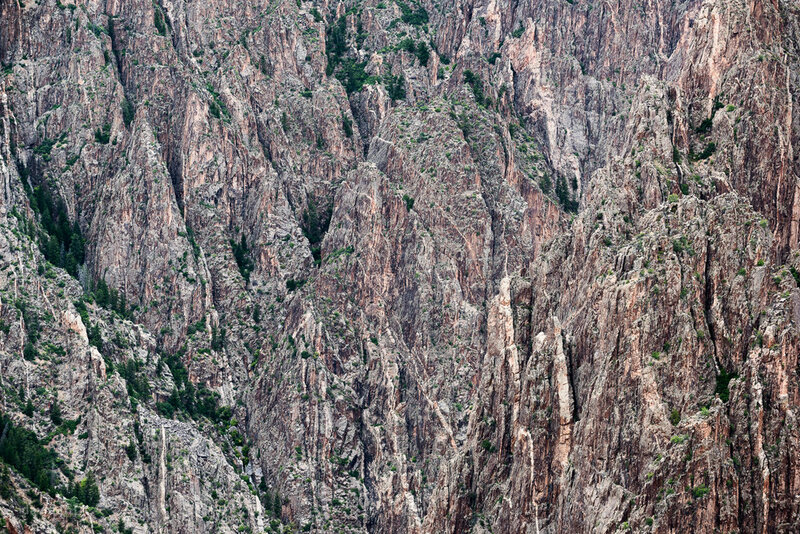 The Black Canyon is a massive gorge on an elevated plateau, dropping down almost vertically. The cliffs are various shades of grey (no pun intended) and give the whole canyon a dreading, deadly look. While the canyon is only about 600 meters wide, it takes around 2 hours to drive from the north rim to the south rim. We wondered as to why there was no bridge. A park ranger was so kind as to explain to us that the north rim and south rim are two distinct ecosystems with vastly different flora and fauna. Connecting them would wreak havoc on the two well-balanced ecosystems. The Black Canyon of the Gunnison is a perfect example therefore, as to how a geological feature can disrupt ecosystems and lead to the evolution of two very different ones over thousands of years. The jagged cliffs of the Black Canyon of the Gunnison. While we enjoyed the camping atmosphere with a big fire, we chose not to spend too much time photographing the canyon. Since there is no real subject aside from the actual canyon, we focused one afternoon on capturing the feeling we had while marvelling at this magnificent place. While doing so, we spotted a small peak within the canyon, on top of which some 15 vultures milled about, chilling and tending to their feathers. Quite the sight, such a large number of those big birds right in front of our binoculars – sadly they were a little too far out for us to reach them with our lenses. Leaving the Black Canyon behind us, I was excited to hit the Great Sand Dunes. I loved the small dunes I had explored in Death Valley, so I was looking forward to some larger ones. Boy was I not disappointed. While the dunes at Great Sand Dunes National Park look minuscule from a distance with the towering mountains behind them, they are mind-bending in size once you stand in front of them. Before getting our shoes full of sand, though, we had to get a backcountry campsite on the Medano Pass road. Finding a cozy spot, large enough to accommodate our guests for the second night as well, we set up camp one last time on this trip and headed to the dunes again to shoot sunset. Luckily for us, the dunes lit up with everything else in shade, allowing us to capture some fantastic contrasty images. The Gunnison River relentlessly carves its way through the Black Canyon. The Great Sand Dunes are lit up during sunset, with the towering Rockies in the background. The following day we welcomed Mike and his son Grayson, two members of the Lee family we had met in Zion. Not wasting any time, we headed to the dunes to do some sandboarding and -sledding. Not having ridden a board ever (snow, water or sand…), everyone suggested I rent a sled. Naturally, I got a board, because what could possibly be more fun than learning how to board on some gigantic sand dunes in the middle of the Colorado Rockies?! Hiking up the dunes was an ordeal, to say the least. Trying to ascend a sand dune is tough , the dunes sitting at 2500 meters above sea level sure did not make this task any easier. Despite that, we had a blast and turns out I’m not all that bad at sandboarding! After about two hours of boarding, falling and getting sand in every possible location, we were happy to find some showers at the bottom before shooting the sunset over the dunes, this time giving Mike and Grayson some beginner camera lessons. 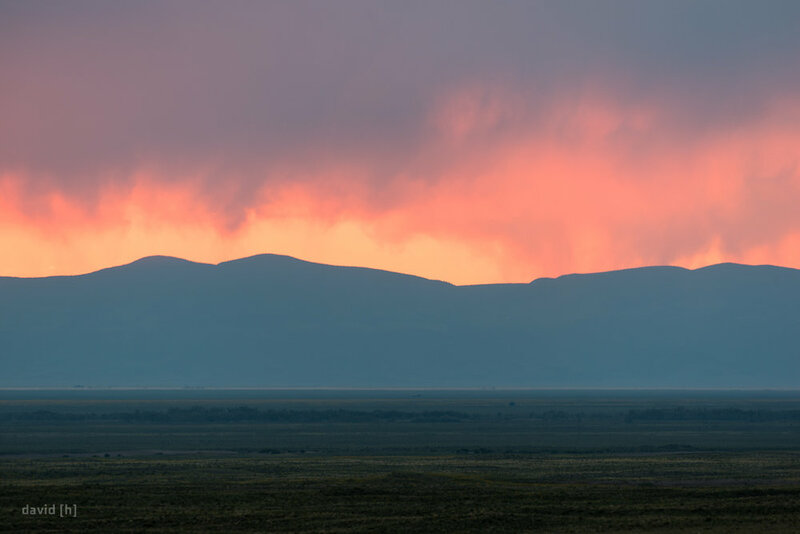 Stunning display of colour through the rainy clouds during sunset at Great Sand Dunes National Park. Back at camp, we sat around a cosy campfire for quite some time, sharing stories from all our various travel adventures, before bedding down in our tents for the last time on this trip. After a good night’s sleep, I rewarded everyone with some bacon and eggs for breakfast – because why not? Thinking back to this entire road trip, the ending could not have been more perfect: being invited to Mike and Chrissie’s place for the following night, getting to enjoy their hospitality, their stories and cuddling with their (insanely cute) dog represented the cumulation of my most dearly remembered moments on this trip. Meeting all those amazing people over the course of 10 weeks, meeting some again (High-five, Dylan! ), sharing stories and enjoying the wonderful landscapes together definitely is the highlight for me. So thanks to everyone I met along the road, thanks to all our amazing AirBnB hosts, thanks to you guys who spent entire days exploring and chatting with us, and thanks to you Derek, for organising and managing this entire trip, creating a summer we both won’t forget. The so-called Diamond Ring Effect during the total solar eclipse, 21 August 2017. While this was the end of the National Park Road Trip, it didn’t mark the end of my time in the US. Thinking we had it all planned out, arriving in Lawrence near Kansas City after 8 hours of driving to shoot the total solar eclipse, we realised shortly after dinner, that the clouds were probably going to ruin our day. Tired, but determined we left our AirBnB only 2 hours after checking in to drive through the night to Nashville, Tennessee, where the forecast promised blue skies for the spectacle. After a total of 19 hours of driving over the course of 22 hours total, we arrived. Exhausted, we set up a little tarp-jeep-tent on the lawn at a highway rest stop and got our cameras and solar filters and glasses ready. We grouped up with our awesome neighbours and what followed cannot be described in words. If I’d have to try, I’d go with magical, mindboggling, unforgettable. A little over 3 hours it was all over, I captured some of the most amazing images and witnessed my second total solar eclipse. Not knowing how to start this blog post reflects my mindset quite accurately. After almost 60 days on the road, always on the go, hunting for that one image at every location, left me quite tired and drained. The beginning of our time in Canyonlands National Park did nothing in mending this feeling: we had planned on spending three nights in the backcountry, driving the White Rim Road, an off-roading scenic drive around the Island in the Sky district of Canyonlands. On the second day, however, we realised that our fuel would not be enough to make the entire drive, so we had to turn around. Disappointed, tired and exhausted, we managed to get a campsite in Moab, the town right next to Canyonlands and Arches National Park. The first light hits the walls of the canyons next to the White Rim Road. Once again, our improvising skills were needed, and we managed to get a few visits to the Island in the Sky district in to get some shots. We witnessed a spectacular sunset, with rain traveling through the canyons towards us, only to leave us drenched, marvelling at the double rainbow that followed. The colours slowly fade away as the sun dips behind the horizon, illuminating the distant rain. Given our tired state of mind, we decided to take it easy, relax a lot and not try to push any shoots, but enjoy the landscape, the thunderstorms and the lightning in the desert. In addition to that, we scraped our plan to shoot Arches National Park, and simply visited it instead. With the park being closed from 7 pm to 7 am, it was inaccessible for sunrise and sunsets anyways and an entire section was closed entirely for road work maintenance. 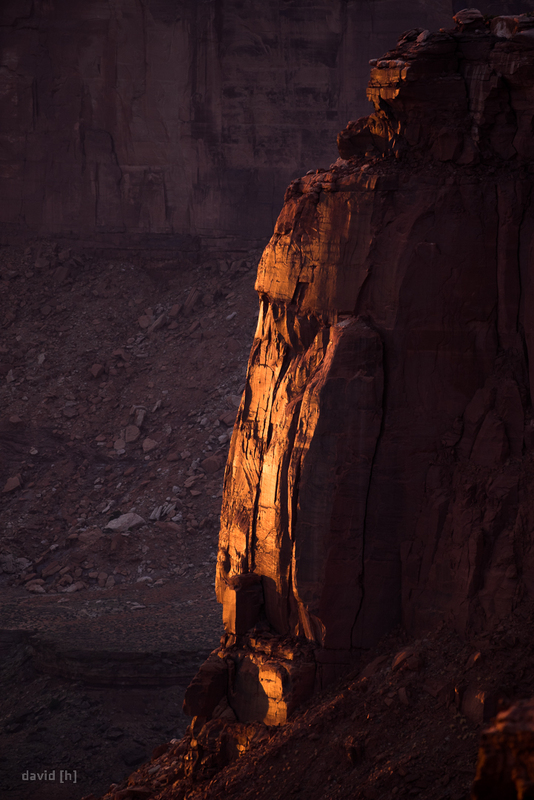 The sun paints a stunning image by illuminating the rain in the canyons of Canyonlands. Where there is light, there is dark - the last rays of sun kissing the cliff face in the canyon. Despite all the closures, being tired, changing of plans and evading lightning, I still managed to capture the available mood in a few images. I've been waiting for a long time to capture an image like this - the sun setting behind the walls of the canyon. The post-sunset storm raging in the distance, bringing in some much needed rain. Not having fully recovered after our time in this area, Derek and I decided we’d need a solid two days of relaxing – so we got ourselves a hotel with a pool, so we could just chill for a bit, and not worry about getting that one shot, before we’d be heading out to the Black Canyon of the Gunnison and the Great Sanddunes to wrap up our road trip. Bryce Canyon has always been a place I have been thinking of visiting as there is a large print hanging in my family’s dining room, so naturally I was looking forward to my three entire days there. Despite having spent 4 nights at the park, the experience can be summed up quite quickly. Since we have virtually not had any rain on our 50-ish days so far, it was bound to happen sooner or later. Our tents were put to the test in Bryce Canyon, getting heavy showers every single afternoon. This did allow us to wind down a little, watch movies, read books, sleep in and work on some photos, which was greatly welcomed. Also, the incoming storms made for some moody skies and I got a few cool images. Unfortunately, I completely missed out on any lighting photos – not for a lack of trying though. However, whenever we saw lightning and immediately set up our cameras, there would not be another flash, period. Still, storm clouds make for awesome images. A storm cell twisting above Bryce Canyon and lashing the orange rock with some heavy rain. Besides the thunderstorms rolling through on a daily basis, I did manage to sneak three sunrise shoots in. 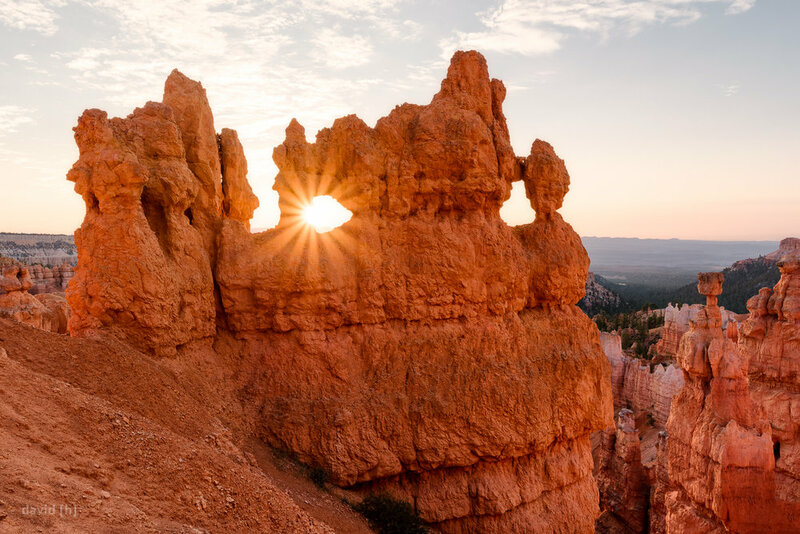 Marvelling at how the spires and windows and hoodoos of Bryce amphitheatre light up bright orange as soon as the sun peaked over the horizon is pure balm for the soul. People should go out more often to witness this daily spectacle! The rising sun bathes the rocky spires, hoodoos and bridges in a lovely orange glow. 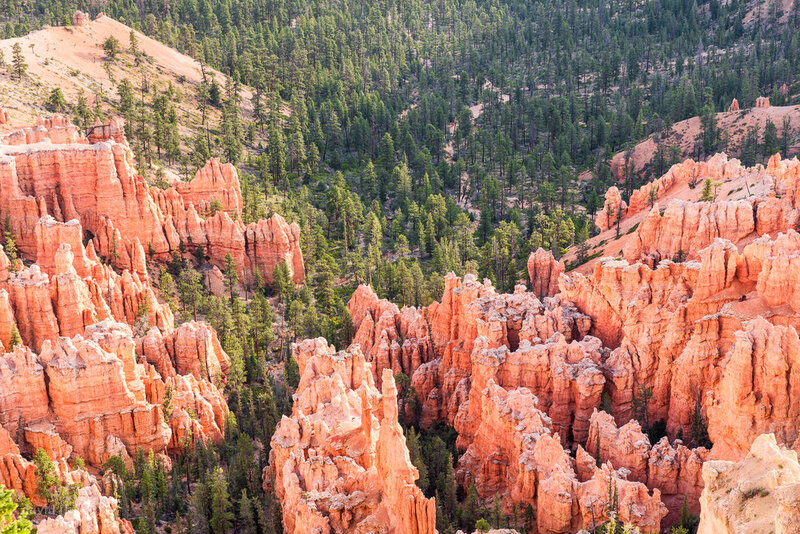 Ridges of hoodoos lead into a forested valley in Bryce Canyon. Besides the sunrise each morning and the thunderstorms, there was another – unexpected – photographic opportunity: wildlife! The place is packed with ground squirrels, chipmunks, Steller’s Jays and deer – so I made use of that opportunity! Getting some images of the chipmunks wasn’t hard – they literally climbed our tents and almost ate out of our plates! 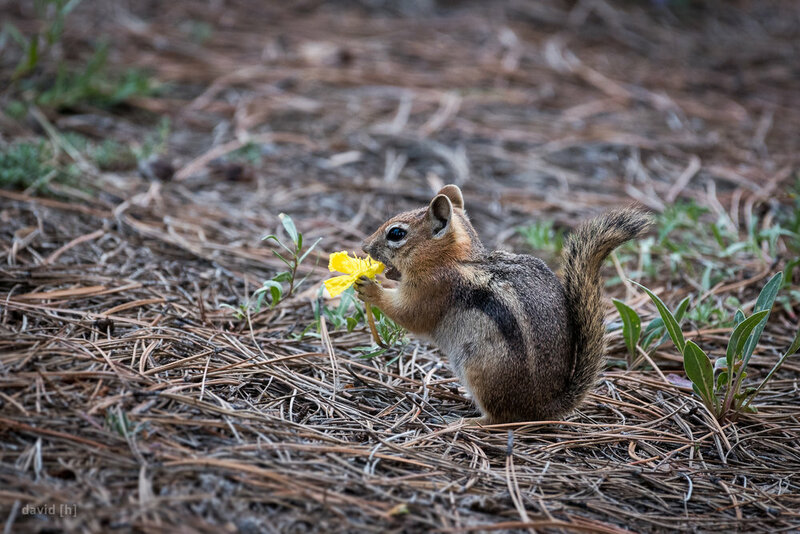 A chipmunk munching away at a yellow flower, right next to our campsite. 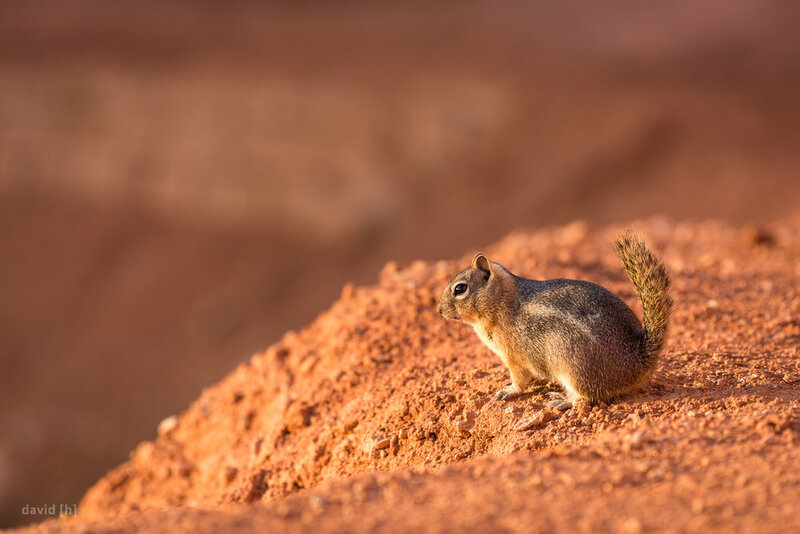 I was not the only one enjoying the sunrise that morning in Bryce Canyon - the local wildlife sure appreciates those moments of silence and beauty as well. With fewer shoots going on than usual, plus the bad weather, left a lot of downtime for us. I did fill some of it with hiking the various trails through the hoodoos, and I have to say, it’s an experience of a lifetime to hike through those amazing rock formations. Orange walls, yellow mounds, red fields of rock, dotted with the occasional green tree or charred stump, towering hoodoos and walls with windows left and right as you walk through this place. I greatly enjoyed the hikes, especially the Fairyland Loop trail (if you ever go – do it! ), as it is a lot less crowded than the other trails. The sun peaks through one of the many windows found in the rock formations in Bryce Canyon. All you have to do is get off the beaten path and you'd be surprised what you'll find! Bryce Canyon was a nice place to visit, wind down and enjoy while hiking and relaxing a bit. I definitely see why the print is in our dining room – I think I’ll put one of mine up there as well. Having completed our visit to Bryce, we headed over to Moab from where we’ll explore Canyonlands and Arches – but not without stopping in Capitol Reef on the way there. The hottest, dryest and lowest… Death Valley holds quite a few records when it comes to National Parks in the US and it certainly did its name justice during our visit. Driving into the park, we recorded a 20 F increase over 12 minutes, so we knew we were in for some toasty days. Before we explored the park, though, we picked up Chris, a friend of Derek’s, who joined us for this stop along our road trip. After settling into our motel outside the park (even we are not crazy enough to go camping in the park during this time of year…), we set out to drive to our first location: the racetrack. 3 hours of driving, over half of it off-roading, took us to the vast and dry playa, famous for the “sailing stones” – rocks that leave tracks behind them in the playa as they move as if by magic. Naturally, the scientific explanation takes away some of the mystery surrounding their travels, so I won’t spoil it for you. Anyways, we ended up photographing quite a few of those stones with the Milky Way as a backdrop. The mysterious Sailing Stones at the Racetrack Playa have been on my to-shoot-list for quite a while! During my late-night stumble over some small dunes me and my camera met our maker: 44 °C after midnight. Thoroughly enjoying the experience, we were a little surprised that it was “only” around 30 °C at night – we had expected worse. If only we knew. The following day saw us sleeping in as we had only gotten back to the motel past 3 am. Derek and Chris went off-roading a little more while I stayed behind, avoiding the heat and catching up on some photo-sorting and blog-writing. After sunset, we headed back into the park to photograph some sand dunes. Fully expecting the night to be as pleasant as the first one, reality hit us hard with 44 °C as soon as we got out of the car. Bear in mind, that is the temperature at midnight we are talking about. The shoot that followed easily ranks in my top three toughest shoots ever, right up with a blizzard about two years ago (I did find me wishing part of me would be back in the snow…). After about an hour, we had to call it a night: we were physically exhausted, stumbling across sand and rock-hard dirt, navigating the bushes in the dark and trying to stay focused in the incredible heat. In addition to that, my camera was reaching the limit of its operating conditions – another hour and I am sure it would have turned itself off – giving me green and red blotches in my images due to the heat. Getting up early to scramble over some dunes was a lot of fun and even paid off in terms of photography! Back at the motel, we embraced the AC in our room and quickly went off to sleep. I was the only one getting up at 4.30 am for the sunrise shoot. Fully prepared for another shock of heat, I started scrambling though some larger dunes to get some desert-feeling shots in. I was treated to some pristine dunes, without any tracks of previous visitors, a nice sunrise and lots of subjects to shoot. The heat didn’t wait long, though, and I left the dunes just as the first visitors started arriving. After 10 minutes of getting sand out of my boots, I headed back to the motel and joined the two sleepyheads for another hour of napping, before we headed out for some breakfast. Chris was leaving again that day, so we said our goodbyes and headed back into the park in the late afternoon. Not even in my wildest dreams could I have imagined what was expecting us in there: we barely managed to have a look at the badwater basin – the lowest point in the US at 88.5 m below sea level – the searing 50 °C chasing us back into the car pretty soon. Our next stop saw us hike to a natural bridge – a stone arch – in even worse 51 °C. Emptying an entire litre of water in just 20 minutes, we hiked in the shade of the canyon and enjoyed the moment, despite the heat, before we made our way to our sunset location – Zabriskie point. Ready for the heat we reached the overlook just in time and immediately got busy shooting. Soon enough, our cameras were hot to the touch again and our eyes felt like they were drying out. It didn’t get any better once the sun set behind the mountains, and neither did the breeze help – it just blew in more incredibly warm air at around 45 °C. The view from Zabriskie Point is something else - stunning rock formations whereever you look. Exhausted and nearly suffocated by the heat, we left shortly before midnight and left Death Valley behind us. Looking back, the experience was something very special: I now know what 51 °C feels like, where the breaking point of my camera is and why the park put up signs saying: hiking after 10 am not recommended. Despite the amazing landscapes that Death Valley has to offer, I am looking forward to a change in scenery (and temperature. Mainly temperature.) in our next stop in Utah: Zion National Park. Yosemite National Park was not on our initial itinerary. Everyone kept asking us, whether we’d stop there, and were baffled when we said we wouldn’t. Well, we did after all. Leaving Lassen Volcanic National Park two days early gave us the opportunity to squeeze in another stop before Death Valley, so we headed to Mono Lake, just east of Yosemite, probably the most famous national park in the entire world. Who can’t pick out Half Dome or El Capitain from a series of pictures? 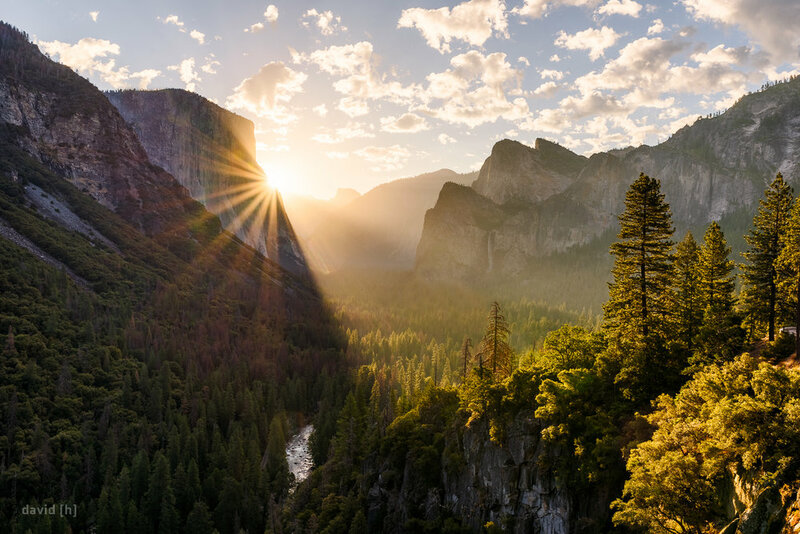 Wanting to make the best of our single day in the park, we rose at 2.30 am and drove to Tunnel View, hedging our bets on a killer sunrise. We expected hordes of photographers to be there, so we arrived with an hour to spare. To our surprise, we were the first people there. Taking our time setting up, I marvelled at the unique sight that is Tunnel View. Despite having seen it countless times in photographs, it really is something else seeing it in person. For a while it did not look great for sunrise – as per usual there were none to very few clouds in the sky. However, this did not last (luckily): just in the right moment little flocks of clouds moved over the valley, ready to be illuminated from below by the rising sun. Fireworks are nothing compared to what came next, I’m telling you. What better location for such a great sunrise? As the sun moved up on its arc, light started flooding the valley, providing a completely new sight every few minutes. We just enjoyed the spectacle, took the occasional photo (okay okay, I admit it, we took A LOT) and were happy that getting up so early was worth it. Once the sun came into view, I switched gears, focusing on what is quickly becoming a new favourite for me: getting out the telephoto lens and isolating single subjects in the landscape, to get some more intimate shots of the scene in front of me. The haze, combined with the dense woods and the golden light made for some amazingly warm images. Satisfied with our catch at Tunnel View, we headed onwards to Glacier Point, hoping we’d still manage to get some photos there in semi-decent light. 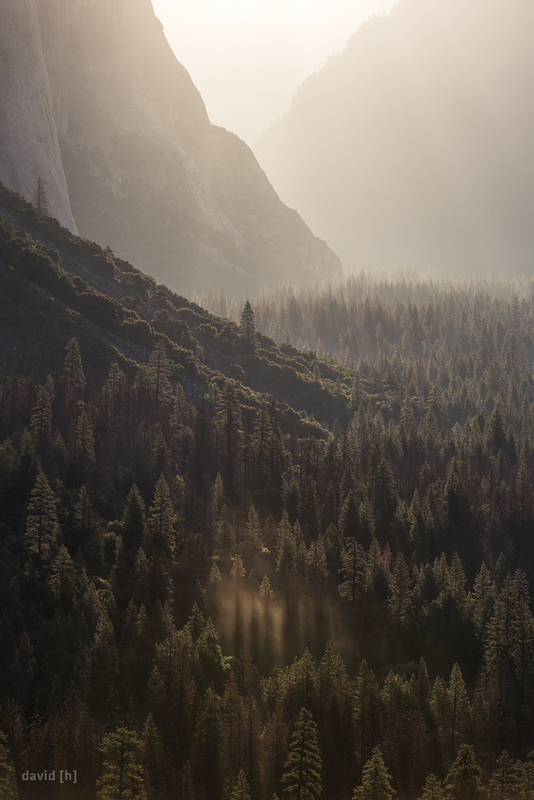 Turns out we were just on time to capture some of the receding haze in the mountains around Half Dome! The sight reminded me a lot of the landscape in Avatar or Jurrasic Park and I absolutely loved the views from there! Taking a moment to relax, pause and let the whole experience sink in, I set up my camera for a timelapse video and just enjoyed being in the magnificent place at this time. Soon we felt our energy fade and decided to have some breakfast in the parking lot – nothing beats porridge and tea on the road after a successful shoot, trust me. Soon the park started filling up with an incredible amount of people, accompanied by maddening traffic in an otherwise such pristine and beautiful spot of nature, reminding me why I am so torn between liking and disliking those parks. We left the park in the late afternoon after I went for a short hike and got soaked by the spray of a waterfall (free shower, yay! ), so we could explore Mono Lake in the evening. Based upon meeting some rangers the day before, we headed to South Tufa on Mono Lake for sunset and possibly some astrophotography. Tufas are towering spires made out of brittle calcium carbonate, once submerged by the lake, they are now exposed as the water level dropped quite significantly. Apparently, South Tufa is the place to be, as we met quite a few photographers that evening. Capturing an amazing sunset, combined with chatting to all the nice people there made it a nearly perfect evening! Having spoken to many of the photographers during sunset, it seemed like we were going to be at least eight people trying to shoot the Milky Way in the relatively small space that is South Tufa. A little worried about people ruining our images with headlamps and flashlights, we headed down to the shore again after nightfall. We ran into some people early on and formed a pact with them: we’d be moving together, shooting together, so that we would all be turning on lights at the same time and not interfere with each other’s images. This turned out to be a really good decision and we worked quite efficiently while having some great company. Derek, Frank, Karen and I held out the longest, shooting for a good two to three hours, getting some amazing Tufa astrophotos and enjoying the company. Moments like those are why I love photography and the exploring and travel associated with it. Tired, up for 20+ hours, putting some serious mileage behind us, but still energetic enough to be fascinated by gorgeous landscapes, meeting likeminded people wherever I end up shooting and forming acquaintances all over the globe. 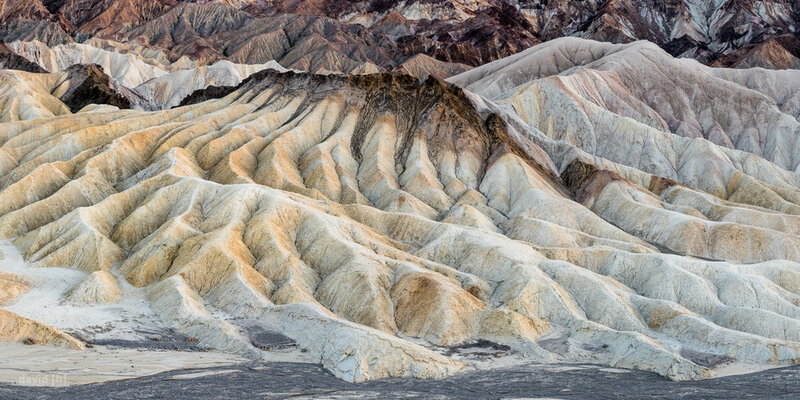 At 2 am it was time for bed, after having been up for 24 hours and having had the privilege to photograph so many stunning places in gorgeous light, I fell asleep completely satisfied and already thinking about our next stop – Death Valley. Lassen Volcanic National Park marked our first stop in California. The park is one of the few places on earth where all four types of volcanoes can be seen in close proximity, so naturally I was excited for it! We started out on the north-eastern side next to Butte Lake, sitting right next to a cinder cone volcano, aptly named Cinder Cone. Upon arrival, I noticed the lake – as inviting as it looked, I first hiked up to the crater of Cinder Cone to earn a good swim. The hike isn’t exactly easy: for every step you take towards the top, you slide back half of the distance just covered. Making it to the top, I instantly knew I’d have to come back for sunrise the following day. The views of the black lava rock, the Painted Dunes, the woods in the distance and Mt Lassen are simple breathtaking. I rewarded myself with a swim in Butte Lake and we had a relaxing BBQ for dinner. While sitting at the table, our neighbour, a friendly retiree, approached us and we ended up chatting for quite a while. He also gave us some bad news: the southern part of the park was not reachable without a several hour detour around the entire area – there was still too much snow on the road. Bummed we wouldn’t be able to visit almost all the spots we wanted, we quickly looked over the maps our neighbour provided us with to come up with an alternate plan. A while later we had an idea of what to do and went to bed. 4.30 am – alarm goes off – shoes go on and I was on my way to the top of Cinder Cone for the second time in 16 hours. I arrived just in time to witness one of the most impressive and rewarding sunrises and following golden hours ever. I’ll just let the images speak for themselves. 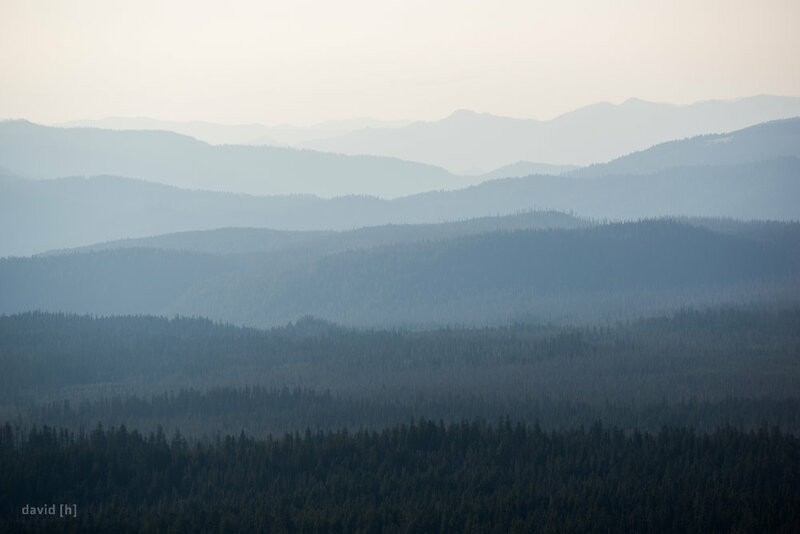 The forests in the distance of Cinder Cone are slighly obscured by layers of haze shortly after sunrise. 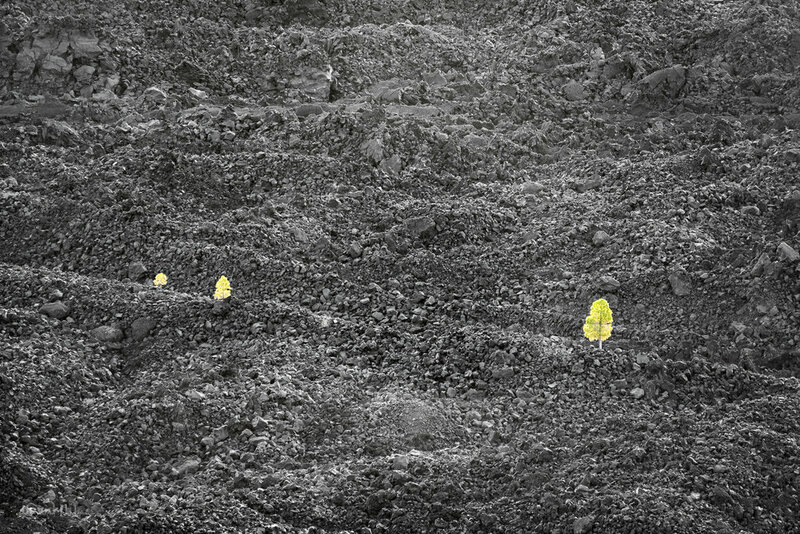 A few individual pines grow amidst the black, jagged rocks of what once was a deadly flow of lava coming from Cinder Cone. The Painted Dunes are a spectacular sight best enjoyed during the golden hours from the top of Cinder Cone. Getting back to camp, I obviously went for a swim again before we packed up and headed to the north-western part of the park, where we would only be spending one night instead of the planned three. We explored the few accessible areas along the road and found some spots where we’d try and do some astrophotography. One of them turned out to be perfect – Chaos Jumbles – where pines grow amidst heavy boulders of all sizes. The galactic center of the Milky Way above the once devastated area now called the Chaos Jumbles. Over 7700 years ago, Mt Mazama erupted violently, spewing pumice and ash all over the place. The eruption kept going until the magma chamber beneath the volcano was all but empty. The peak collapsed into the now empty chamber beneath, forming a huge crater. Over the centuries, snow and rainfall filled the crater to form what is known as Crater Lake today. Needless to say, I was excited to visit and photograph the lake in the caldera of a volcano! Driving in, we were surprised to see how much snow was still left up here! Already on this initial drive, we had to stop to photograph the beautiful mist and haze hanging between the various hills in the distance. It’s not something you see every day – and it had us forget the 15 °C despite wearing nothing but flip-flops, shorts and a t-shirt! Haze in the late afternoon can create magical views over a series of hills and ridges, creating finely separated layers. After getting to our campground on the south side of the crater and having some dinner, we wanted to take advantage of the exceptionally clear skies and low light pollution, to shoot the milky way from the north rim. That’s where things started going downhill: We knew the west rim road would likely be closed as some road work was in process, so we tried the east rim road. A few miles in, we hit a barrier. Closed. Disappointed, we turned around and tried the west road, but as suspected, that one was closed as well. We were essentially trapped on the southern side of the crater, with perfect conditions for some astrophotography. Annoyed, we started looking into alternatives. There was no way we’d miss out on those skies, and that meant not camping in the only campground available. The following morning we found a motel close by that had 2 nights available and we jumped on it. Since check-in wasn’t till 3 pm, the manager recommended us some waterfalls, one of which we’d already heard from Kyle, whom we met in Glacier national park. We headed there, and wow..! What a cool place! A big waterfall coming out of a gorge, which itself features another couple smaller falls inside! We quickly realised that the light wasn’t good enough to shoot it in the afternoon, but we still enjoyed flying our drones and scouting the area a bit. The magical Toketee falls from bird's eye view using my DJI MavicPro drone. Back at the motel, we relaxed until it was time to head out for some night photography. Boy were we not disappointed! Rarely have I seen skies this clear and this dark. With plenty of compositions to shoot, we spent about two hours in the icy wind on the north rim of Crater Lake, capturing the milky way and the lake. The Milky Way over Crater Lake - some of the clearest and darkest skies I've ever seen! Due to the road closures, a lot of the hiking trails were not accessible, but the boat tour was still on – or so we thought. On our 2nd morning, we were booked on a tour to Wizard Island – the only island in the lake – to go hiking there. Upon checking in, we received some more bad news: one of the two operating boats had broken down the previous day, so we were bumped onto the guided lake cruise instead of the Wizard Island tour. Bummed, but still glad we got to do something at least, we embarked on the hike down to the lake. Stunned at the incredible colours of this lake – its blueness is putting the best blue skies to shame - we quickly forgot that we were forced to change our plans and thoroughly enjoyed the 2 hour cruise. We learned a lot about how the lake was formed, how extremely clean and clear it is, and how its water level is maintained. 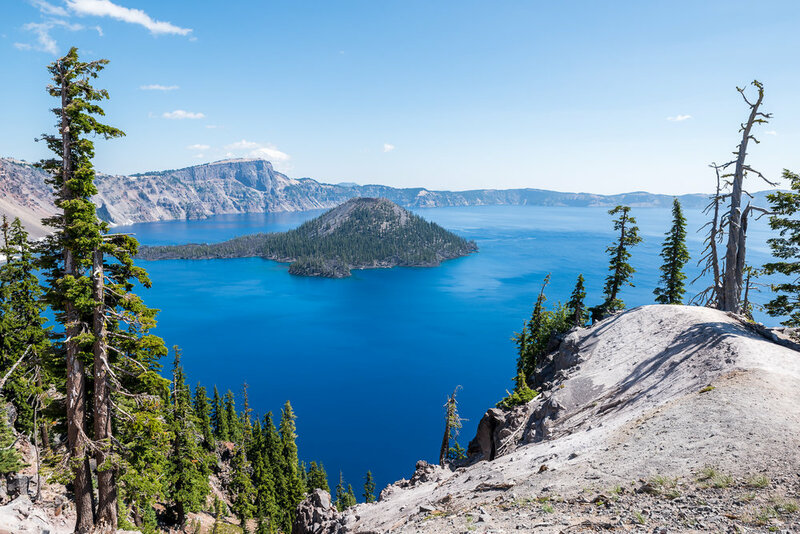 The unmatched cleanliness of Crater Lake makes it shine in an incredible blue. Towards the evening we headed back to Toketee Falls in order to shoot them in good light. What fun that was! Climbing down steep cliffs with some makeshift ropes, getting all kinds of different shots with the drones and cameras, we spent over 2 hours at the falls. Satisfied, we made our way back to the lake to shoot some more night skies. The wind was fierce again, but didn’t keep us from getting some more awesome shots! Toketee Falls in the late afternoon - the big waterfall flowing out of the gorge, which by itself contains a couple more, smaller falls. Even though another day was planned at Crater Lake, due to all the closures we decided to head out a day early and visit some waterfalls on our way to Lassen Volcanic national park. I’m looking forward to some more waterfalls – really enjoying shooting those beauties right now – and to spend some more time camping instead of mediocre (at best…) motels. 6500 miles after leaving New Jersey we arrived in Portland – having driven across the entire continent, east coast to west coast. Portland also marked the (almost) halfway point of our road trip. Taking a break from national parks, we had an AirBNB as accommodation, indulged in pub visits and finally got to see Wonder Woman in theaters (wow!). Also, we invited Dylan up to stay with us, after getting to know him as our camping neighbour in Yellowstone. The three of us had a blast hopping from pub to pub, exploring Cannon Beach and scrambling across logjams to access hidden waterfalls! Upper Latourell Falls in the Columbia River Gorge - just couldn't resist posing in this green oasis! Photography wise we had planned on exploring the Columbia River Gorge – famous for its countless waterfalls lining the cliffs. Among the highlights were Latourell Falls, Bridal Veil, Oneonta Gorge, Upper Horsetail Falls and the world famous Multnomah Falls! After having realised how much I enjoy waterfall photography back in Glacier National Park, this was pure heaven for me! The highlight of the waterfalls definitely was Oneonta Gorge! To access the waterfall, we had to climb over a logjam, wade up-river through waist-high ice-cold water! Severely overcrowded during the day, it cleared out towards sunset and allowed us to get some sweet shots! 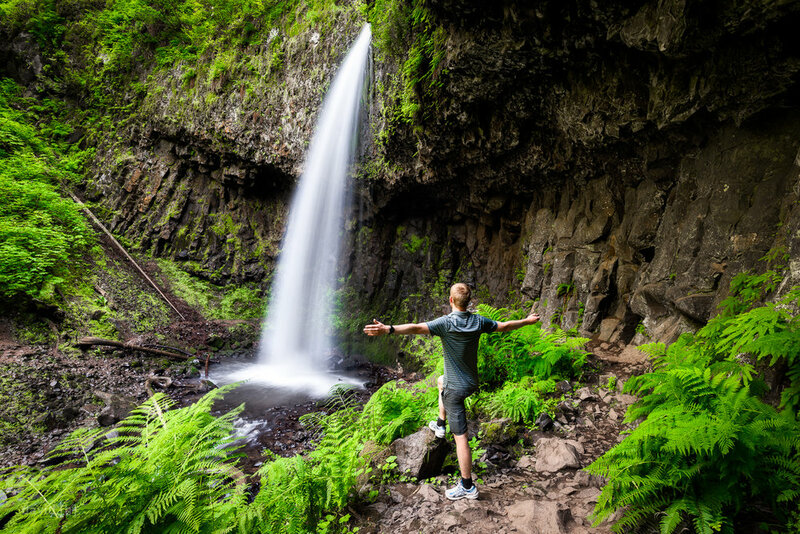 Bridal Veil Falls are located a few minutes off the Columbia River Gorge Scenic Highway! Since drone operation is strictly illegal in national parks, my drone had not seen much usage. Time to change that! We headed to Cannon Beach and Ecola State Park on the west coast to capture the sunset with the drone. What fun! Accessing the beach was a bit sketchy – to say the least – and I’m glad I came away with only one scraped shin and muddy boots after sliding/running/falling down the dusty cliffs. A rock formation in front of the coast at Ecola State Park - complete with seagull colony and tunnel! On our way out of Portland, we headed over to Mt Hood National Forest, to shoot the Milky Way behind Mt Hood, reflected in Laurance Lake. Sadly, the lake wasn’t still enough for the reflections, but it was still a sight to see the centre of our galaxy behind Mt Hood. The climb over a logjam, wading through waist-deep water and waiting for the crowds to clear out are absolutely worth it at Oneonta Gorge! After sleeping in the following morning, going for a swim in the lake, having our weekly skipping-stone-competition (I lost this round…) and having some breakfast, we headed out towards Crater Lake National park. 5 weeks done, 5 weeks still to go. The climate will definitely be a lot dryer in the upcoming parks – not that we’d been having lots of rain. The weather is sticking to its trend: dry, hot, no clouds. We still would wish for a little more clouds at dawn and dusk, but I’m not complaining about the lack of rain at all! Talk to you after we hit midway point of this road trip!